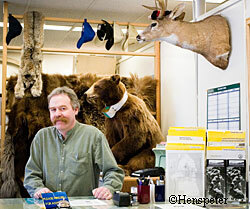 CHris Frary at the front counter in the Douglas Fish and Game office. Photo by Mark Henspeter. When 14-year-old Chris Frary moved to Alaska in 1967, he didn’t forsee that in 40 years he’d be holding down the front desk for the Alaska Department of Fish in Game in Douglas. Frary is the face of Fish and Game for many people who come in to the Division of Wildlife Conservation looking for information on hunting and wildlife, and to reporting hunting and trapping successes. Frary began working in his stepfather’s outboard engine repair shop in Juneau as a teenager, and then opened and ran his own business until the early ‘90s. He began working for the Sport Fish division at Fish and Game about six years ago. Three years ago he switched to wildlife conservation at the Douglas, Region 1, office. Frary sees a lot of the local hunters and spends time sealing wildlife such as bears, wolverines, and the occasional goat, as well as providing hunting information and materials such as hunter education booklets, registration permits and hunter surveys. An open resource for the public, Frary is on the receiving end of scores of phone calls relating to all aspects of wildlife. He is often the first to be notified of many of the urban bears in the summer, as well as the appearance of wildlife such as the now well-known black wolf at the Mendenhall Glacier. He fields countless hunting questions, wildlife queries, and Fish and Game correspondence throughout the year. One of his favorite phone calls was from a tourist paralyzed with fear, trapped in a phone booth by a bear that was casually dining on berries outside. Another time he was called by a frantic pet owner tearing through the woods in search of his dog, which had been abducted by a wolf at the Mendenhall Glacier. In his time not spent behind the desk, Frary is an avid outdoorsman and musician. In addition to hunting for deer in the fall, Chris also is a keen fly fisherman. He enjoys the many great opportunities for salmon and trout fishing during the summer months. For many years Frary has been involved with the music scene in Juneau and the surrounding area. A bass guitarist, Chris has performed in a number of bands around town and has five bass guitars. He’s also a carpenter and a cabinetmaker, and helped build his house and do the finish work and additions. An integral part of the department, Chris manages the varied aspects of his position with ease. Organizing, distributing, and interacting, Chris keeps the public informed and helps Fish and Game do its job. Chris has extensive knowledge of southeast and its wildlife, and uses it well. Although maybe not what he would have expected years ago, his position in Wildlife keeps him busy and puts a smiling face behind the desk. Mark Henspeter is a high school senior in Copper Center, Alaska. He wrote this profile during a week-long visit to Juneau and Douglas as part of the Alaska Close Up program. He’s pursuing wildlife biology and spent time learning about the Alaska Department of Fish and Game.